Welcome to summer in Bozeman! We’ve got a lot going on, so read to the very end. Row by Row runs from June 21 to September 7. You must come in the store (or have a friend come in the store) to buy your kit. We cannot ship kits or patterns until November 1. 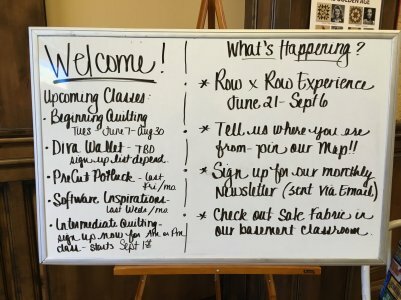 Want more info on Row by Row? See https://www.rowbyrowexperience.com. Happy hunting: we’ve moved stuff around in the store! We have a gorgeous new display in our window featuring the Arcadia and Lollies quilts, both paper piecing kits sold in store. 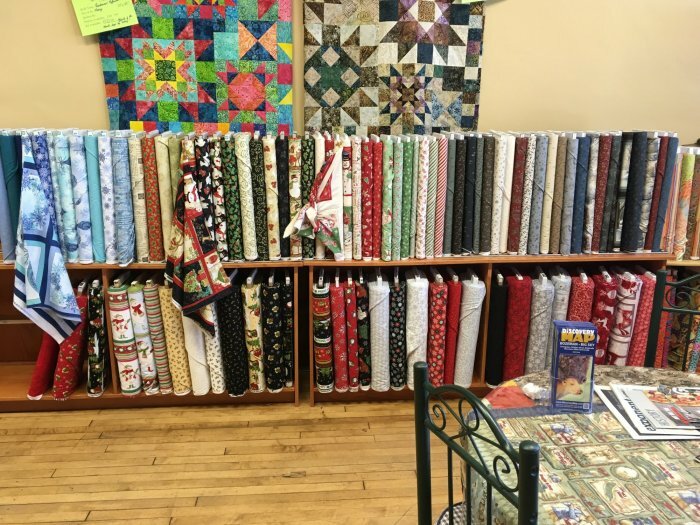 Alas, it was time for Bobcat fabric to take a backseat; there is now Bobcat Corner in the back of the store. 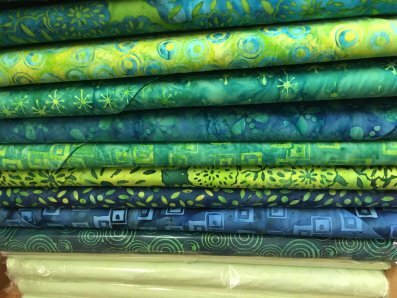 Tula Pink and Kaffee Fasset are featured front and center, and we have lots of coordinating pre-cuts too. But don’t worry, we have a special surprise for our next window in August, just in time for MSU students and family to return to Bozeman! Also in above photo is Quite Contrary, a kit we're offering. 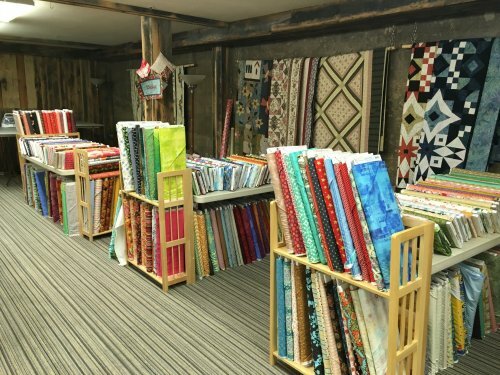 Be sure to check out the sale fabric downstairs. 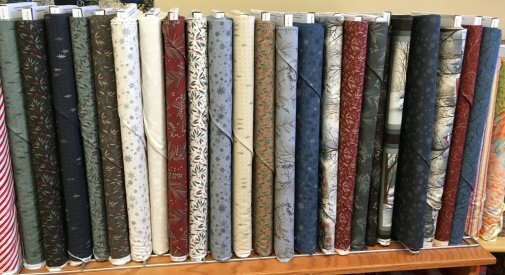 We’ve added lots of new fabric and updated the displays, so it’s easier to see fabrics. For July we will be making an autumn table runner out of either two mini charm packs or one charm pack and 1/2 yard coordinating fabric. Join us July 29. 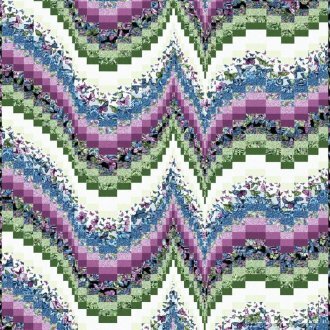 A true Bargello method class will be coming utilizing Ann Lauer’s newest pattern. We have kits being cut in lovely fall colors. You won't want to miss this- we are doing all the hard work for you!! Sign up early- This class will fill quickly. There will be some pre-class sewing required. Class: Tuesday, September 10 or Saturday, September 13. Pre-registration is now open! This session is only offered once-a-year, so don't miss out! 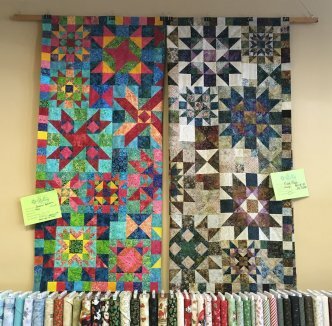 If you have taken our Beginning Quilting class, our Intermediate Quilting Class is a great next step for you. 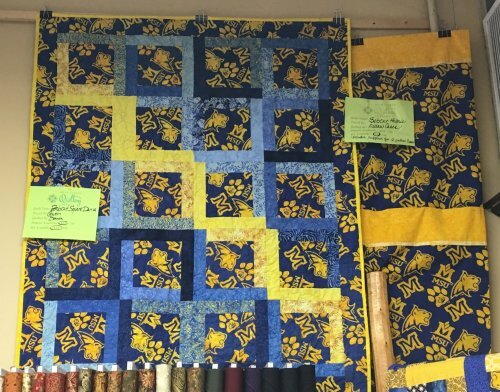 We will build on the skills acquired in the Beginner Quilting class and will take it to the next level in your quilting. Class runs for 14 weeks and does require weekly cutting to be completed prior to class. I will give you all the logistics at our intro class on Thursday September 1. Class list and supplies will be picked up at first class. Class runs September 1 to December 15, every Thursday. Cost: $160 plus supplies. Leslie McNeil of Marveles Art Studios is coming! Check out her amazing collage work below. McNeil walks you through the entire process, so you’ll leave with a finished product. Two day class, Friday September 30 to Saturday October 1 from 10:30am to 4pm. $75. See more of Leslie's work at http://marvelesartstudios.com/. More fabric postcards have arrived. 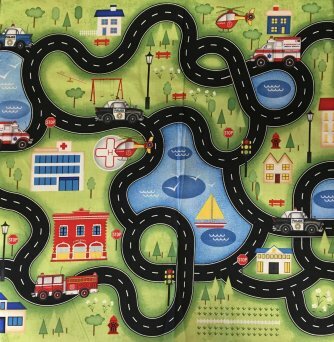 These are high quality images are printed on fabric and sew just like normal fabric. 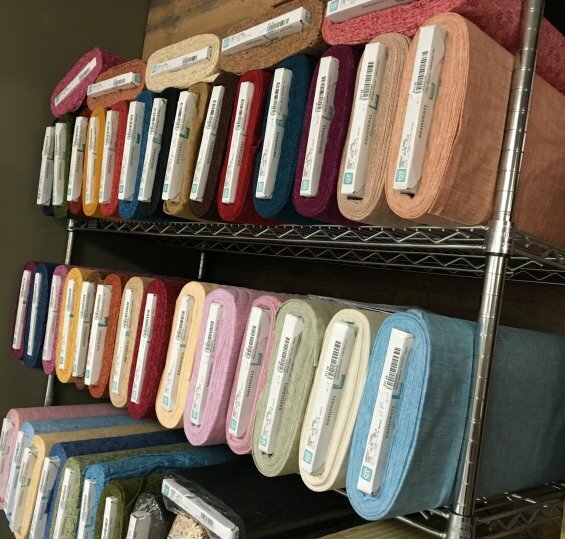 They are made right here in Bozeman, and we are proud to offer this quality local product. 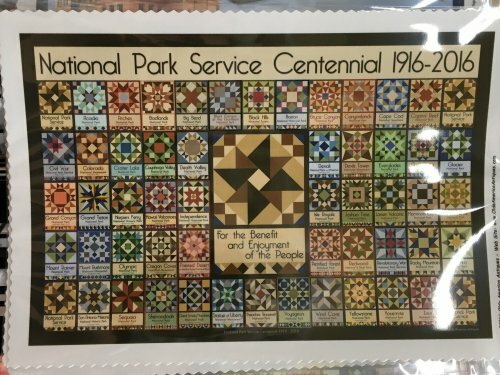 We have large sizes honoring the National Park Centennial, postcards of all 50 states, and new Montana themed cards. Note: We only have one of every state, but we can easily order more! An adorable new collection from Jennifer Pugh honoring society’s civil servants. It features a play road panel perfect for racing MatchBox cars. We’ve got the panel as a tablecloth, and it looks great. 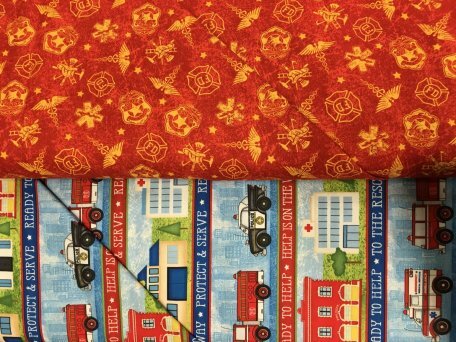 Coordinating fabrics show police cars, fire trucks, and hospitals in primary colors. Playmat kits are available. 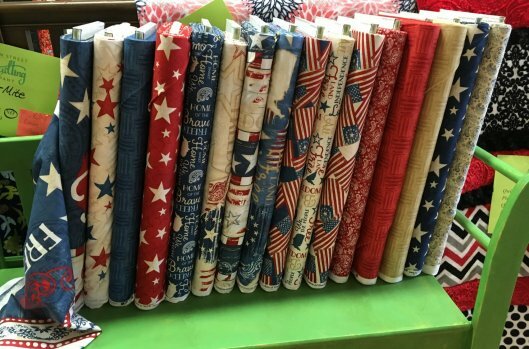 Also by Jennifer Pugh is the “Colors of Freedom” collection, a whimsical patriotic collection. 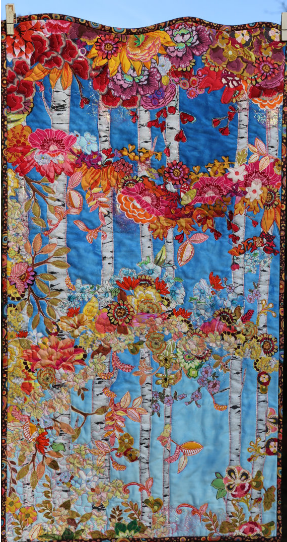 We have patterns featuring this fabric for some great quilts and wall hangings. 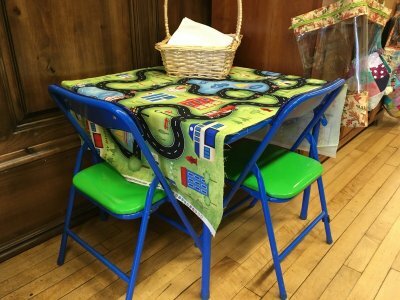 Table runner kits include enough fabric for coordinating placemats. Spooky! 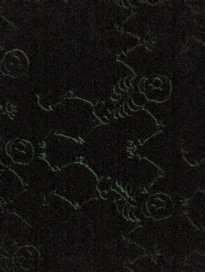 We have glow in the dark fabric! Pictured is Moda Halloween and Henry Glass glow in the darks. The skeletons glow in the dark! This line has been super popular. 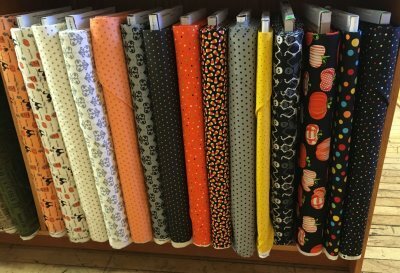 We have yardage, jelly rolls, and charm packs. Need ideas? 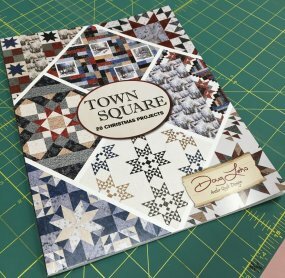 Moda released a book of projects featuring these fabrics including quilts and many smaller projects. Tons of holiday flannel is in stock. This is thick, cuddly, want to wrap-yourself-in-it flannel. We also have some flannel pre-cuts from Moda. Flannel is the bottom row. Brand new Moda flannel (still in plastic). We have pre-cuts of these. 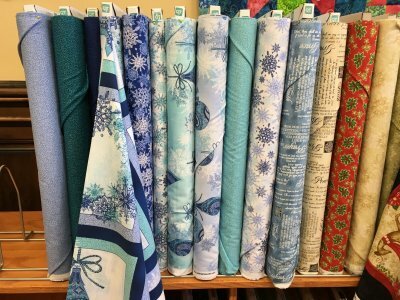 Snow is flying in with this fabric. Snowflakes are the featured motif in everything from Christmas ornaments to general snowscapes. Collection features cool blues, turquoises, and teals. A fun kit is coming soon. 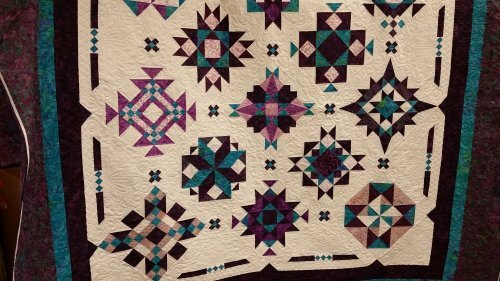 Gwen designed and released a kit of this quilt a while back. 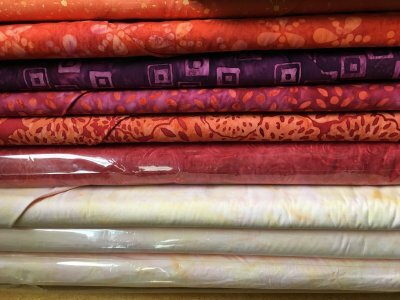 She found the same fabric in her travels, and we’re featuring it again! 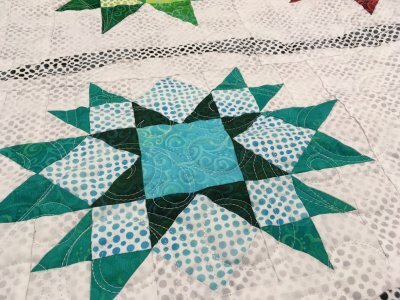 Made with a jelly roll, this quilt goes together quickly. Need a quick baby quilt? Look no further. 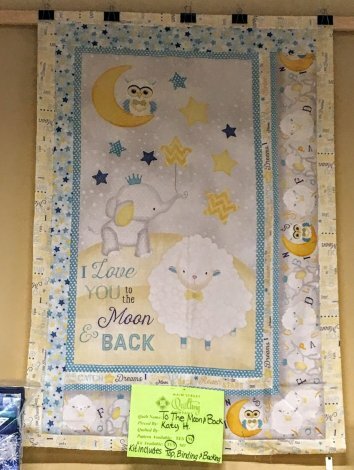 Border the large panel with printed borders, and you’ve got a gender neutral quilt featuring sheep, elephants, and owls. Kit includes binding and backing. We’ve kitted this once already, but it went so fast that we cut more. 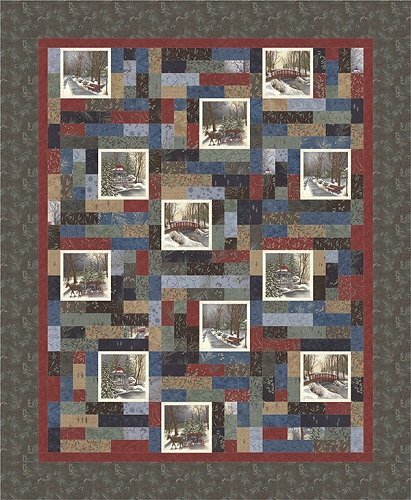 It’s a great winter quilt that will doesn’t highlight the holidays, so you can use it all winter. 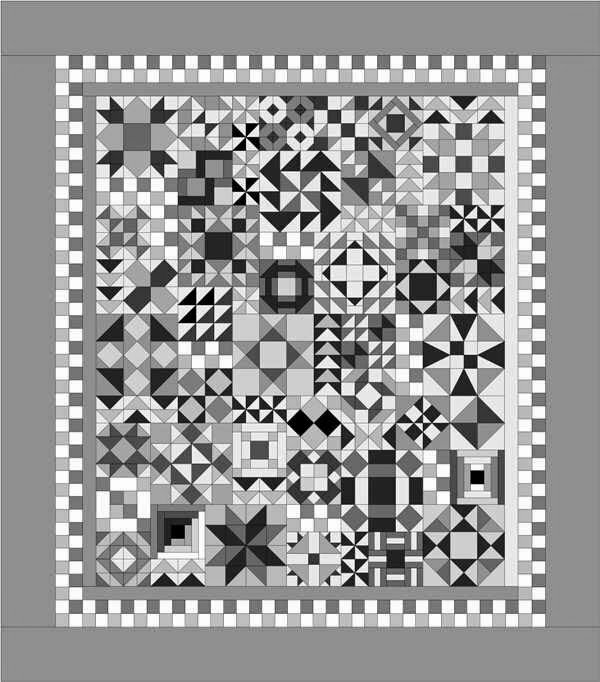 It’s a scrappy quilt featuring pre-cuts. 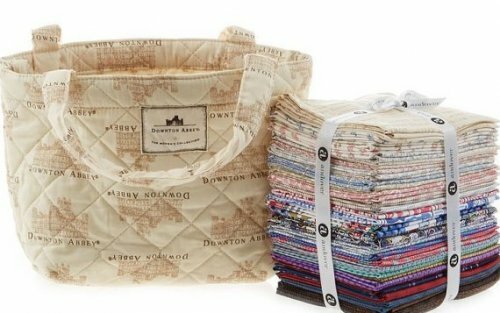 Kit includes the book, jelly roll, charm pack, and additional fabrics. New blocks of the month are coming soon. You don’t have to be a local to participate; we ship all over the USA! 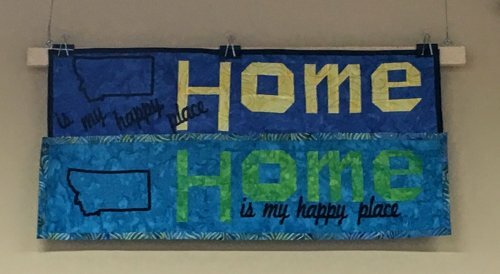 This is the same batik quilt but in two very different color ways. Radiant reflections is bright and exciting and River Rock is lovely browns and nature colors. Each month you receive a layer cake and pattern to make the blocks. Finished size is 78”x85”, large enough for a double or queen bed. We have limited quantity on River Rock, so call today! This flannel block of the month sampler will walk you through lives of Women in the Bible while teaching you a variety of traditional blocks. We have customized this Block of the Month with our own colors and are working on cutting the months right now. Here’s a sneak peak of the fabrics we've chosen and the pattern. 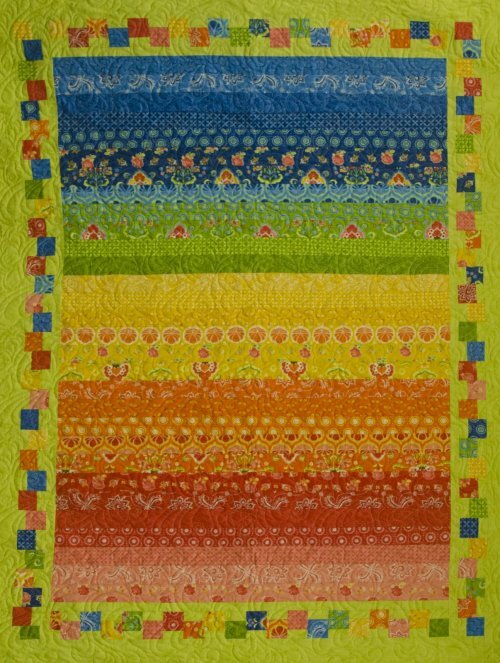 Batik block of month from Island Batik. We’re making it in two color ways: (1) pale green with icy blues and (2) pale peach with warm pinks and oranges. 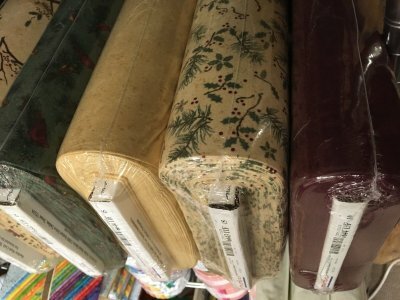 Sneak peaks of the fabrics are below. Starting in August is another star quilt that shimmers with pale polka-dots. A white background with pale grey dots is contrasted by black with white dots vertical stripes. Stars of blue, purple, orange, and bright green really pop out about this background. Don’t be scared by the polka-dots; they’re super subtle and add an amazing texture to this quilt. Come in the store to see me right side up! 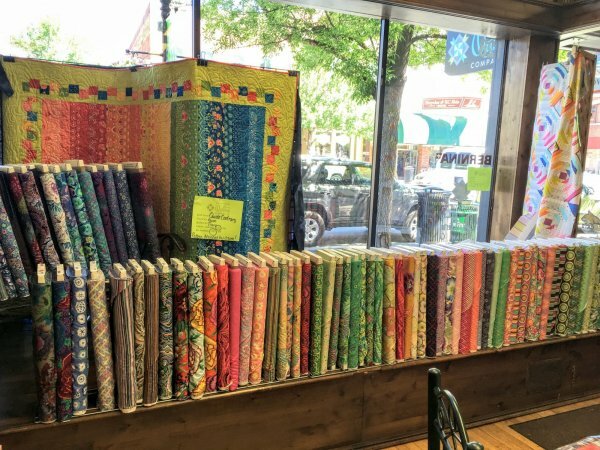 Though the Cats aren’t in the front of the store anymore, we’ve still got it and the coordinating fabrics located together. 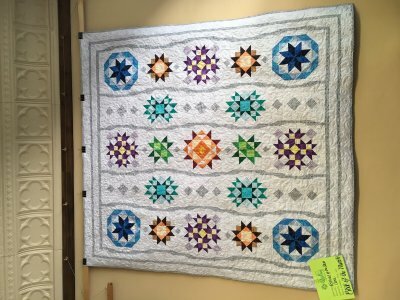 Bobcat Corner is in the back and features the Bobcat Square Dance quilt. Gwen designed this quilt. The pattern is in process of final tweaks and kits are coming soon! We do repair and maintenance on all makes and models of sewing machines and sergers. Cameron, our repair technician, comes to us next on July 6-7. His reservation list always fills quickly, so call us today at 406-586-6097 to reserve a slot.